They say never judge a book by its cover, but with records it's different. 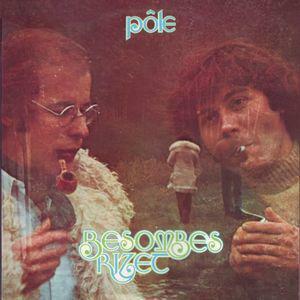 Just one furtive glance at the evocative cover art for Pôle for instance, and you can almost smell what it sounds like. Besombes and Rizet converge under the sepia-tinged psychedelia of the facade, one wooly-haired in rollneck sweater smoking a fag, the other bespectacled with pipe in chops, sporting fur trim, cravat and turquoise chemise. It's a conducive meeting of minds, visages and tobacco choices in soft focus walnut brown, while in the distance, the pair wander through bucolic pastures, perhaps on the qui vive for champignons magiques. They look like sonic scientists, ready to take music to its outer limits, which is of course exactly what they were up to in 1975 when they collaborated on this long player. Who can say why the best French records are invariably made by two people? And yet one thing we can be certain of, is that this is part of that lineage. Issued 40 years ago, it still has the power to bend minds. Much is known about Philippe Besombes - from the northern Parisian suburb of Saint-Denis - on keyboard, synthesiser, accordion and guitar; trained as an organic chemist, he pursued instead a career as producer, technical director and moog-meister, and his contemporaries include Jean Michel Jarre. In 1975 he also performed a number of concerts under the banner L'atelier de Libération de la Musique alongside the enigmatic Jean-Louis Rizet (keyboards, synths, flute, trumpet, guitar), who is written about less on the internet, though he did notably work on the soundtrack to Luc Besson's 1985 movie Subway (a film M83 based their entire career upon). Incidentally, the pair met while working on a ballet in 1974, and they're both still going strong in the present (though they've been working separately since the mid-70s). Their collaboration quickly sold all of its original 20,000 copies, and when it went out of print it became a covetable cult collectible for vinyl heads, sought after in brocantes and changing hands for silly money on eBay later down the line. Julian Cope wrote enthusiastically about it in 2006, and according to the Arch Drood, the original record was the first on the Pôle label, with the graphic added to the cover at the last minute against Besombes and Rizet's wishes (some even subsequently thought it was by a band called Pôle with the album named Besombes/Rizet). Now Pôle has finally been re-released by French label Gonzaï, the people also responsible for the excellent French independent monthly magazine of the same name. So then look at the artwork and try to imagining a marauding sci-fi-inflected French experimental rock album made by two étudiants d'expérimentations sonores, and you will undoubtedly have an idea what to expect from this album. But that doesn't even begin to adequately convey the splendor that awaits once you put the needle to the groove. 'Haute Pression' immediately bounds over the horizon on a stampeding synth groove, whipped forward by alert moog and splenetic rolls of percussive thunder. It lasts for 11 masterful minutes, and is less a track, more a lysergic adventure. 'Armature Double' on the same side is a more reflective beast with lashings of atmospheric mellotron, at least until it goes into wild sonic workshop mode; it clocks in at just under 12 minutes. Naturally there's no more room left for tracks on side 1, though on side 2 they manage to squeeze three more ambient soundscapes within the confines of the plastic (there's an extra track one can download on a piece of card within the inlay). 'Lundi Matin', with its incessant parping horn, is probably how Roxy Music would have sounded had Bryan been deposed instead of Brian. I've not mentioned the 'P' word yet, but it's fair to say this album is a prog chef d'oeuvre, an epic, sprawling soundscape full of mystery and hidden sounds to enjoy over and over again or discover afresh with each listen. You might be able to judge a record by its cover, but sometimes that's only half the story.